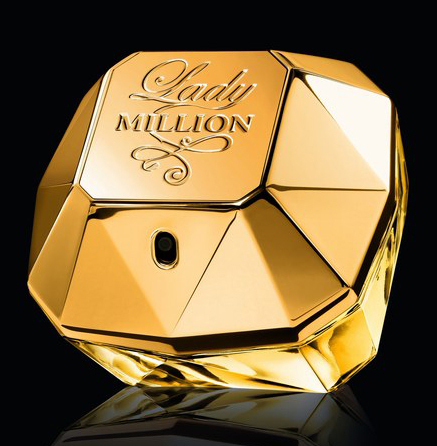 Paco Rabanne’s Lady Million brings together two of my top loves – perfume and diamonds! This is no ordinary casing – modelled after the famous Régent diamond (a mammoth 410-carat uncut sparkler from the Golkonda mines, which was fashioned into a 141-carat cushion brilliant that went on to grace the crowns of Louis XV and Louis XVI, before adorning Marie Antoinette‘s headpiece; it is currently on display in the Louvre), this multifaceted bottle has been visualised by Noé Duchaufour-Lawrance, renowned designer of both objects and interiors. Rabanne’s own architectural influence is also evident in every detail, right from the carefully calibrated thickness to the quality and weight of the glass and even the colour (diamonds are cold, but the bottle is a warm, sensual gold). As for the fragrance itself, to be honest I was less than blown away at first whiff. However, once it came home and settled down a bit (how could one resist such a striking design), somehow, somewhere things clicked into place and its currently my favourite perfume for the season. The honey notes (rare in a fragrance), combined with the voluptuousness of orange blossom, patchouli, vanilla, neroli and Arabian jasmine make it both mellow and theatrical – perfect for the party nights or as a quick pick-me-up during a long and weary day that necessitates some cheering up!